Please find attached agenda for the General Meeting to be held at the Roma Administration Centre on January 22, 2014 at 9.00am. 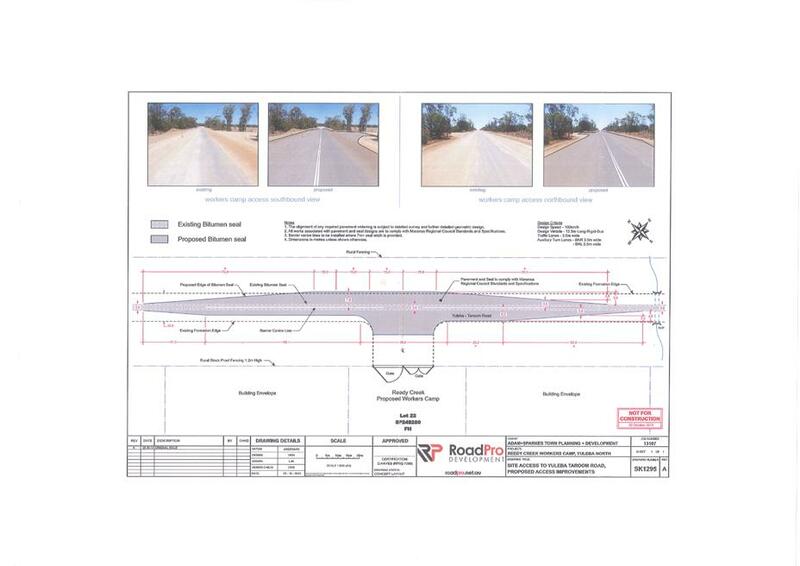 Thank you for your Councillor Customer Feedback form addressed to Councillor David Schefe dated 20 November 2013, outlining your request for Council to provide a bitumen seal to Daisybank Road, Euthulla. I have undertaken an initial review of your request and have allocated this matter to Kylie Fleischfresser – Specialist Infrastructure Planning for further investigation. 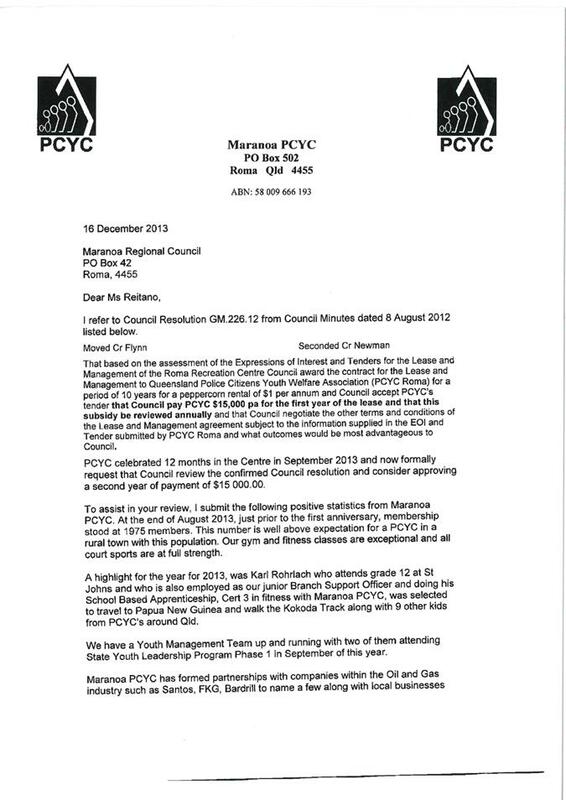 Following this investigation, a report will go to the Council meeting of 8 January 2014 for resolution. Following this meeting we will advise you of the outcome. Again, thank you for bringing this matter to the attention of Councillor Schefe, I will continue to keep Councillor Schefe and yourself informed through to finalisation of your request. 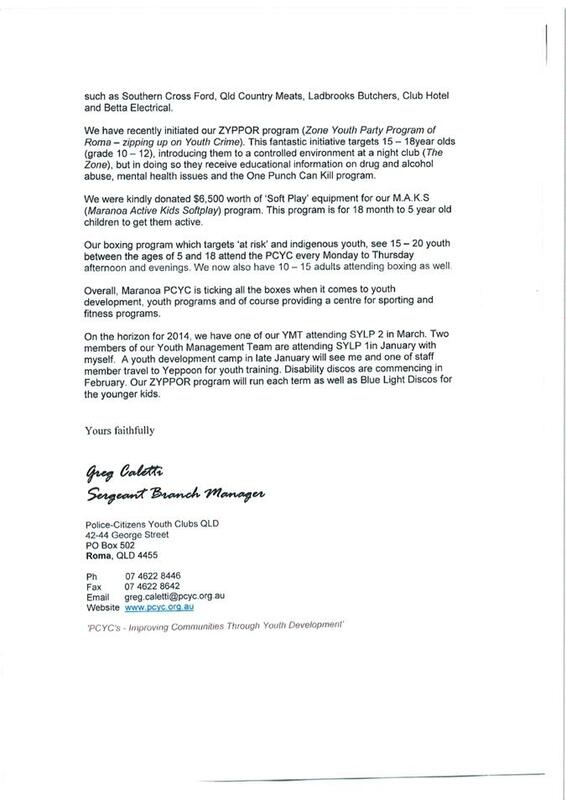 Please do not hesitate to contact Clara Aitken of my office on (07) 4624 0712, or by email – clara.aitken@maranoa.qld.gov.au if you have any further questions or concerns with progression of this matter. 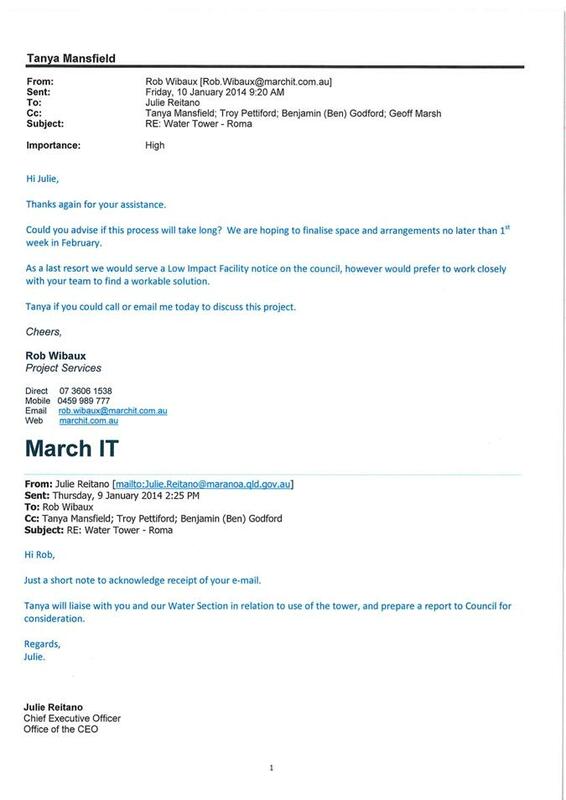 Thank you for your correspondence addressed to Council’s Chief Executive Officer, Ms Julie Reitano dated 5 November 2013, in which you request the closure of a section of East George Street between Ashburn Road and Beaumont Drive, Roma. I have undertaken an initial review of your concerns raised and have allocated this matter to Kylie Fleischfresser – Specialist Infrastructure Planning for further investigation. 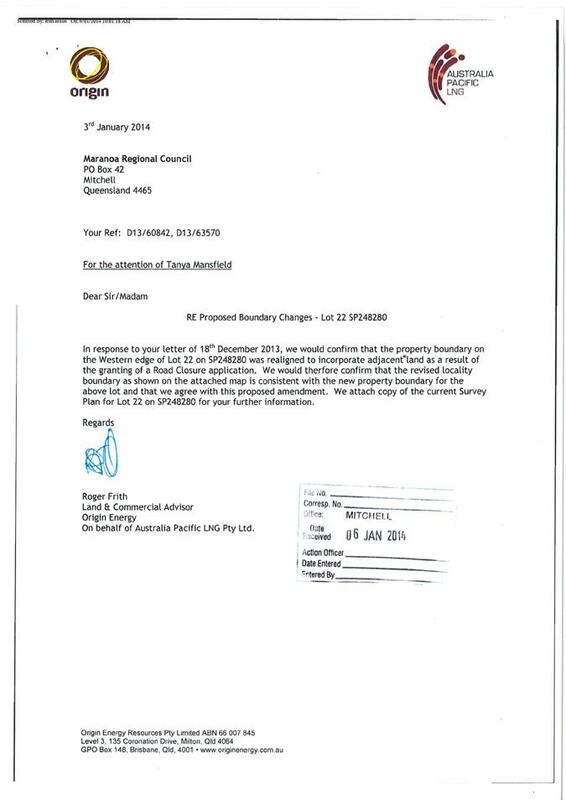 Following this investigation, a report will go to the Council meeting of 8 January 2014 for resolution. Again, thank you for bringing this matter to the attention of Council’s Chief Executive Officer Ms Reitano, I will continue to keep you informed through to finalisation of your request. I am writing to confirm that I have sighted the details of your request for information lodged with Council on 30 October 2013. 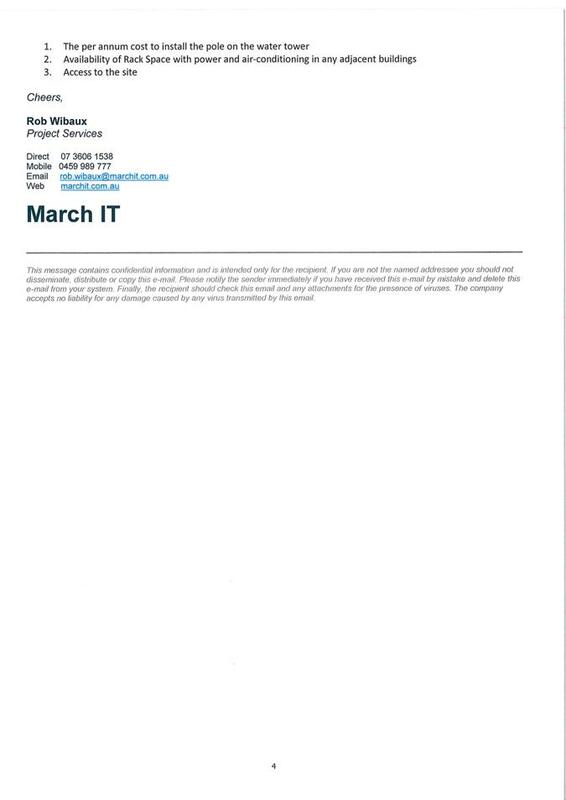 I have forwarded your request to Council’s Acting Director - Infrastructure Services, Mr Michael Parker. He will review your request and coordinate a reply for you. If for some reason you have not received a response by 17 December 2013, you are welcome to contact Lizzie Elmes of my office (4624 0642) or myself and we will investigate the reasons for the delay on your behalf. Please rest assured that we will aim for a quicker response if at all possible. 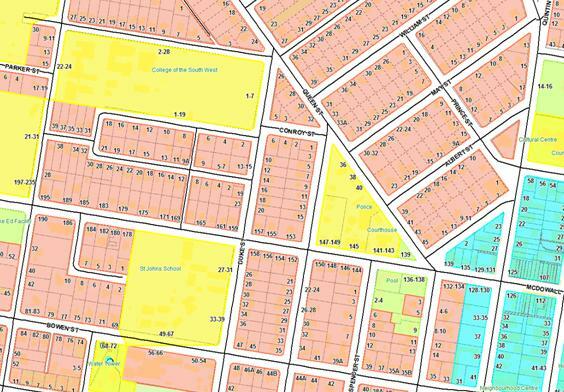 Councillor Kajewski reported that Mr Harold Rose of Bungil Street had reported a dust nuisance from traffic using the section of Short which adjoins his property. Roma Town Council wishes to advise that as from Tuesday 14 October 2003, the section of Short Street between Bungil Street and East George Street will be closed to all traffic, apart from pedestrians and cyclists, until further notice. Alternative means of access are available via Ashburn Road and East George Street. Insert this advertisement in: Western Star, Tuesday 14 October 2003. 5 – Very High Risk – Considerably Dangerous - Majority of structural elements and/or lack of signage seriously hazardous road environments and require early intervention. 4 - High Risk – Majority of structural elements and/or lack of signage create hazardous road environments and require early intervention. 3 - Medium Risk - Substantial structural defects present and/or lack of signage creates hazardous road environments that require intervention. 2 - Low Risk – Low structural defects and/or minimal signage. 1 - Compliant – Grid complies with 2012 Grids and Gates policy. 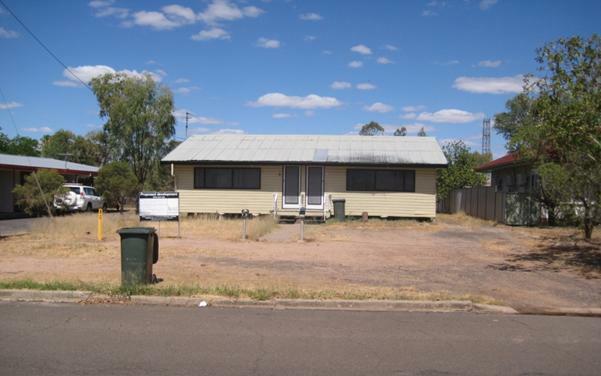 The application seeks approval for a Material Change of Use for Accommodation Units (2 additional units) on land situated at 16 Duke Street, Roma QLD 4455, described as Lot 2 on RP150861. The site is currently occupied by a dual occupancy. 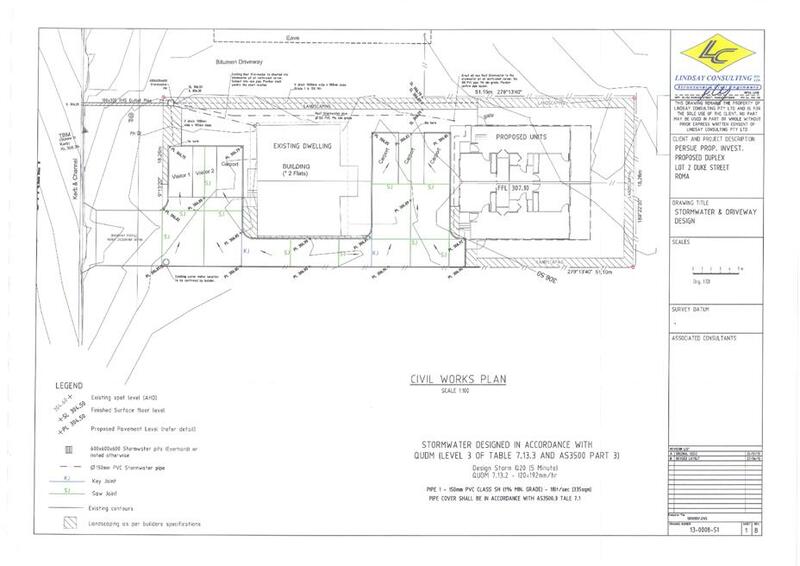 It is proposed that the existing dwelling units be retained and two additional single-storey units be established at the rear of the property. The existing dwelling units each comprise two bedrooms and one bathroom. 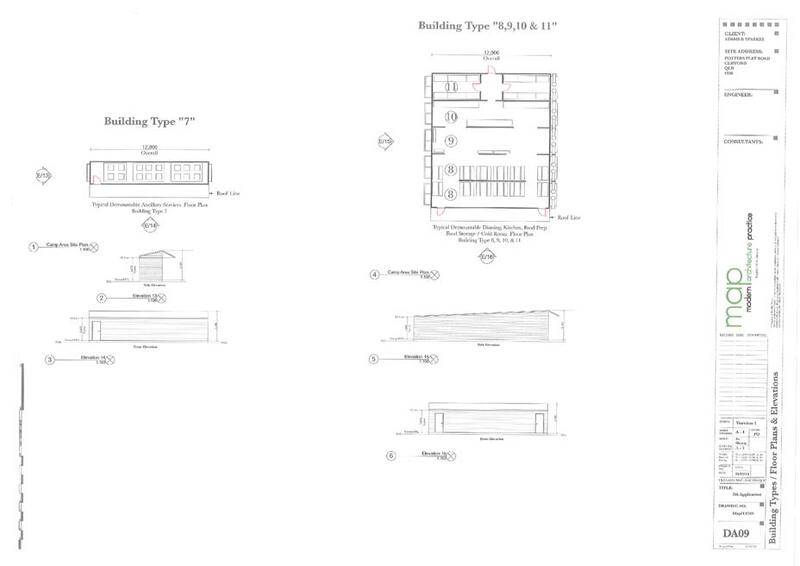 The proposed dwelling units will each contain two ensuited bedrooms. The development includes the construction of two carports catering for four vehicles in addition to two uncovered visitor car parking spaces. The application is subject to Impact Assessment against the relevant provisions of the planning scheme. Public Notification was carried out from 21 October 2013 to 11 November 2013. No submissions were received during this period. The proposal is for residential development and is not situated in proximity to the Town CBD. The development will not adversely impact on the efficiency, attractions or vitality of the commercial area. Additional onsite car parking spaces will be provided to cater for the intensification of the existing land use. The development site is located within an established residential area with infrastructure and services available to provide a suitable living environment for residents of the dwelling units. The proposed units are of comparable scale to the existing units onsite and integrate with the built form and rural amenity of the town area. The development will have minimal impact on the streetscape as the additional units will be largely obscured from view at the street frontage by the existing building which is sited towards the front of the allotment. The development involves the intensification of an existing residential land use within the Urban Area. The proposed units will be limited to a single storey and consistent with the scale and character of residential development in the area. Landscaping and screen fencing will be established along site boundaries to enhance the visual amenity of the site and ensure privacy for occupants and adjoining residences. Due to the positioning of the existing building at the front of the site, little of the additional units will be seen from the street frontage. The development is consistent with the intent of the residential area and will not adversely impact on the safety and convenience of cyclist or pedestrian movements in proximity to the site. Conditions of approval will require the provision of vehicle manoeuvring areas within the site, to ensure vehicles can exit in a forward direction for improved visibility and safety. The development is not located in proximity to a rail corridor. Access to the site is obtained via a local access street which is designed to cater for residential land uses. Conditions of approval will require stormwater from the development site to be collected and discharged to ensure no increase in post-development flows to adjoining properties and no adverse environmental impacts. The development will gain access to Duke Street via a two-way concrete crossover. This will be imposed as a condition of approval. The development incorporates provision for six onsite car parking spaces which is compliant with the minimum requirement of 1.5 spaces per dwelling unit. The proposed car parking arrangement includes the provision of a single carport per unit plus two uncovered visitor parking spaces. Conditions of approval will require all access, car parking and manoeuvring areas will be sealed with an approved impervious surface ensuring all weather access to the existing road network. The development proposal does not involve the creation of new roads. 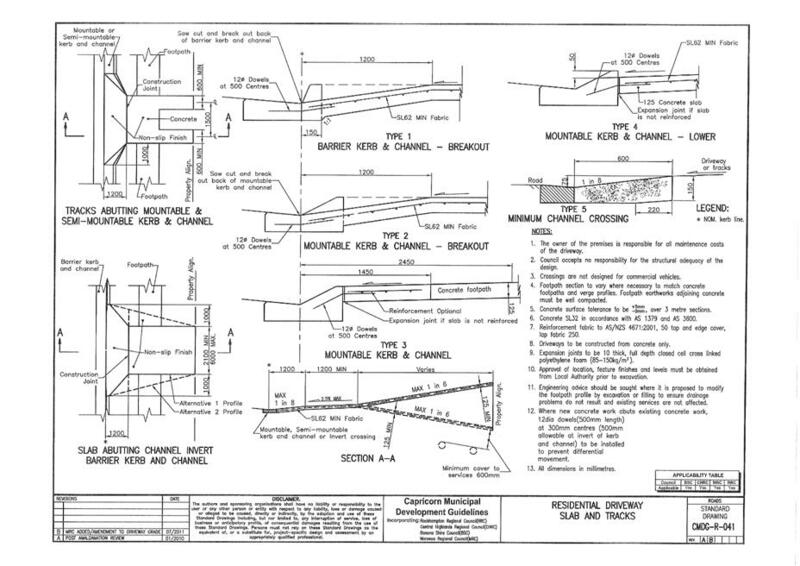 Conditions of approval will require the construction of a sealed vehicle crossover to provide all weather access from the site to the roadway. The proposed development involves the establishment of an additional single storey building on the site. The maximum building height above ground level will not exceed 6.3 metres, which is consistent with the character of the urban area. The combined footprint of both the existing and proposed buildings (including carports) will occupy approximately 346m2 of the site, equating to 37% site coverage. The building footprint will occupy. The development is sensitive to the local character and amenity in this respect. 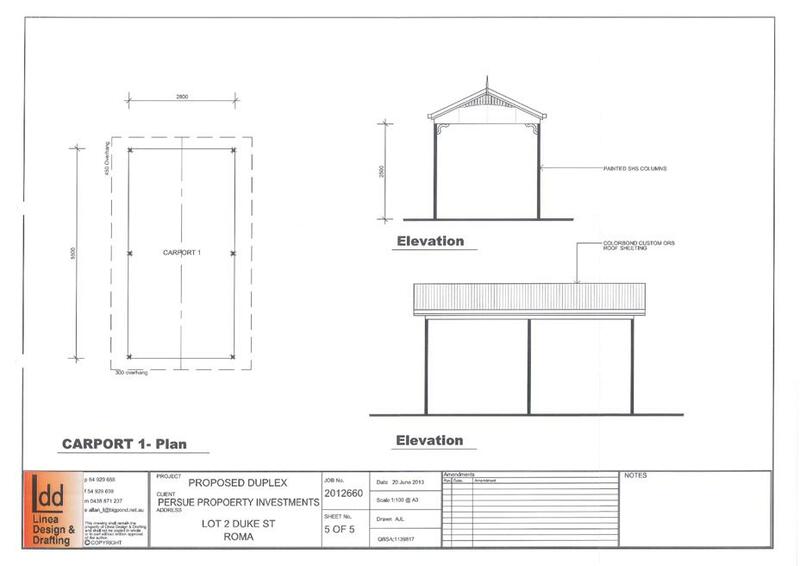 The establishment of a carport in front of the existing building will result in a setback of 5.85 metres from the front property boundary. A minimum setback of 3.0 metres will be provided from the proposed building to the side boundaries of the site and 5.0 metres clearance provided to the rear boundary. 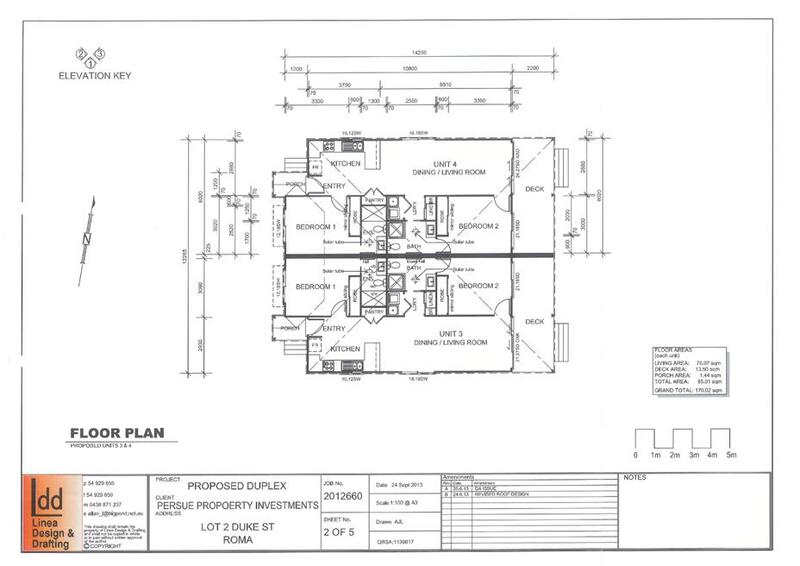 The existing building will maintain clearances in excess of 8.0 metres to the Duke Street frontage and 2.6 metres and 3 metres to the northern and southern side boundaries respectively. 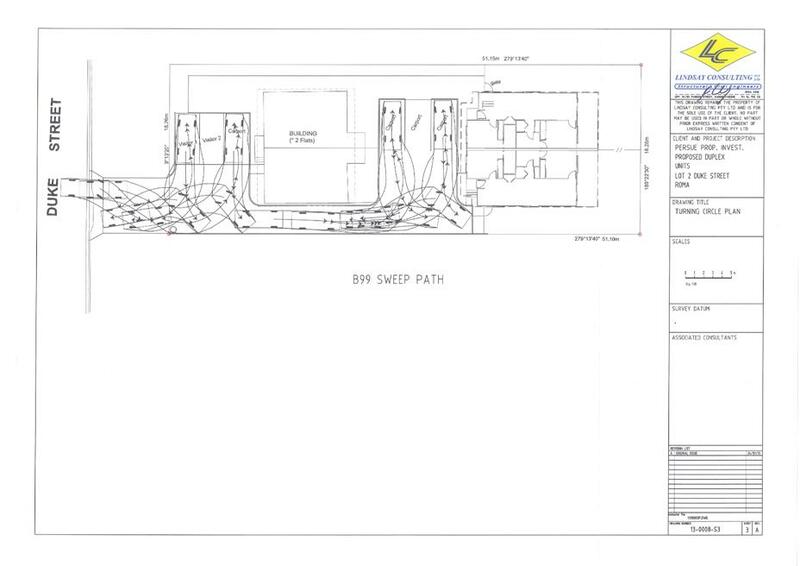 A 1.15 metre relaxation of the front boundary setback and 2 metre relaxation of the rear boundary setback will be required to accommodate the proposed development. It is considered that the reduced setbacks will not compromise the character and amenity of the area. The siting of the additional units closer to the rear boundary, allows the provision of onsite car parking, manoeuvring areas and private open space for residents of the existing units. 4. 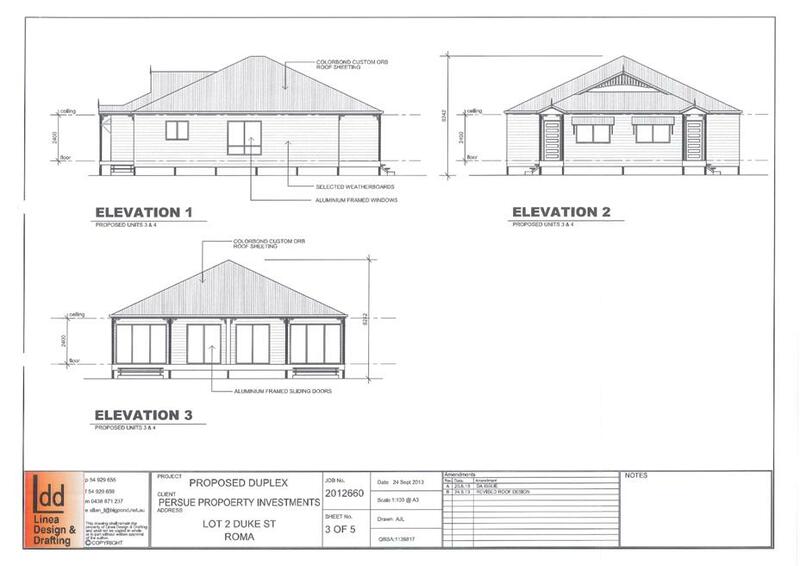 Development Approval 2012/18746 for a Material Change of Use - Accommodation Units (2 additional units) situated at on land at 16 Duke Street, Roma QLD 4455 and described as Lot 2 on RP150861. 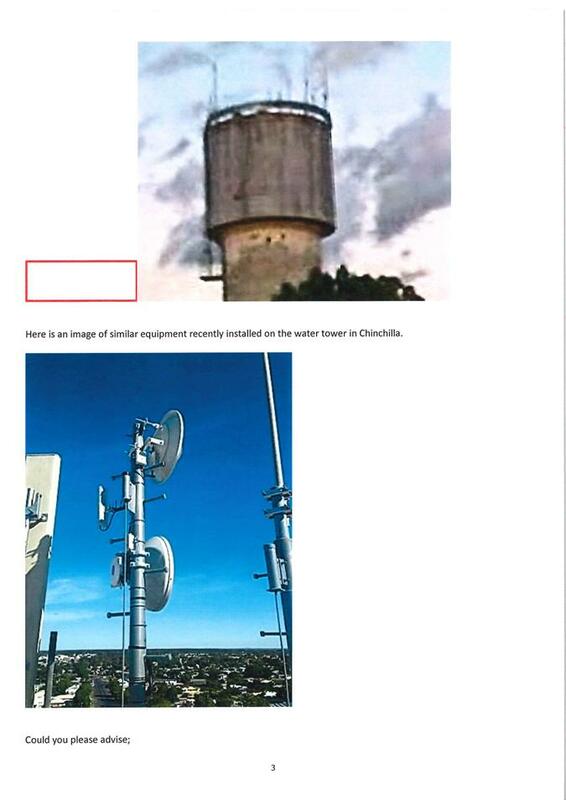 $30,000.00 is payable as infrastructure charges. 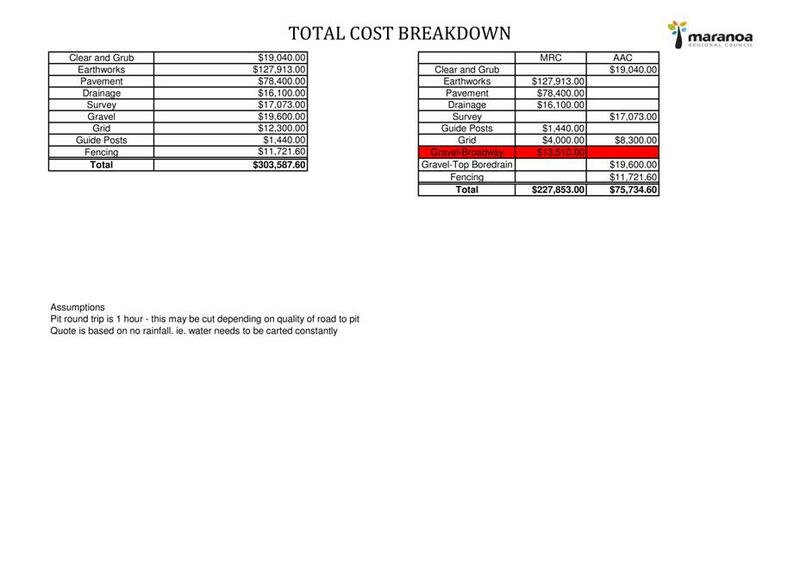 This is based on an adopted charge of $15,000.00 per 1-2 bedroom dwelling unit. A discount of $30,000 is applicable based on the monetary equivalent of the existing lawful use of the premises. 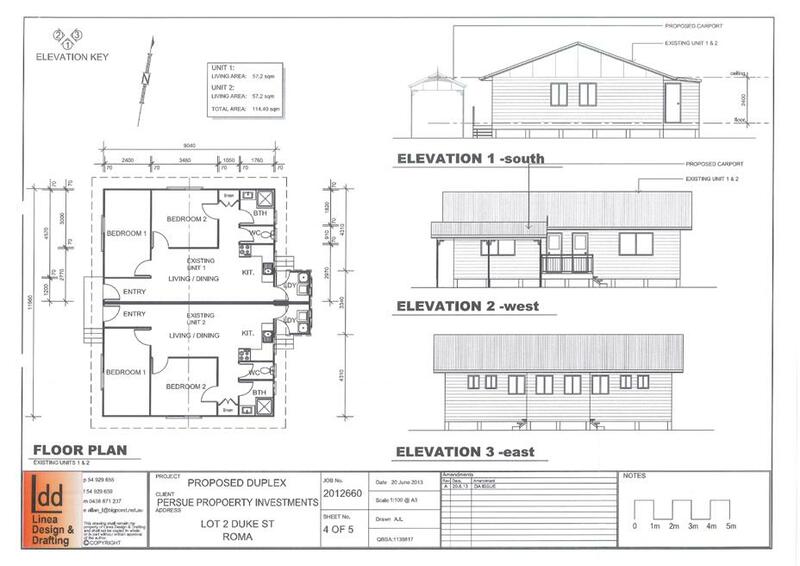 This charge is levied in respect of a Development Approval for a Material Change of Use - Accommodation Units (2 additional units) situated at on land at 16 Duke Street, Roma QLD 4455 and described as Lot 2 on RP150861. 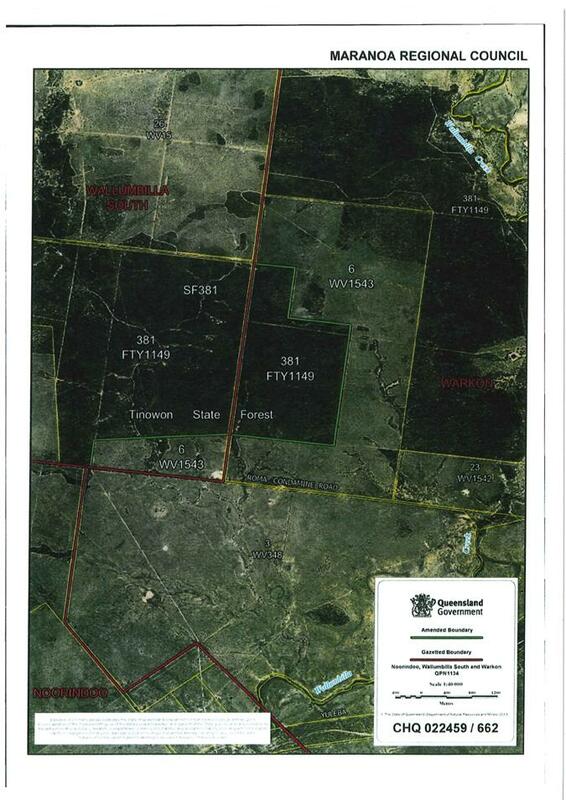 The application seeks to establish a Material Change of Use for "Extractive Industry”, Reconfiguring a Lot (Access Easement), and Environmentally Relevant Activity 16 – Extractive & Screening Activities, on land at 3584 Duck Creek Road, Highland Plains QLD 4455 (described as Lot 70 on WT800341, Lot 71 on WT288, Lot 72 on WT327). The proposal includes the extraction and screening of up to 1,000,000t per annum of hard rock quarry material, intended for civil construction purposes. 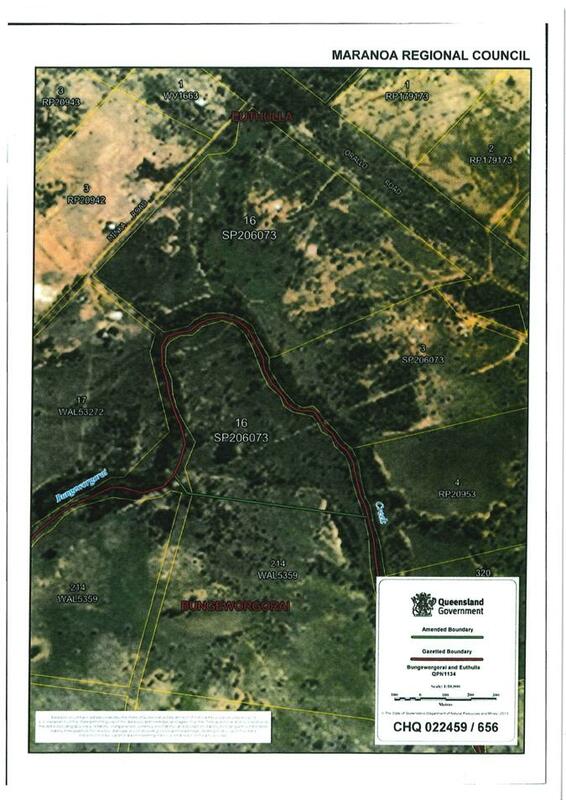 The quarry, situated within Lot 72, will occupy a work area of approximately 53.73ha of a 5,210ha lot. The extraction techniques include “ripping and pushing” with a dozer, and also blasting. The proposal includes creating two (2) vehicle access easements, approximately 10m in width, with a combined length of approximately 5km. 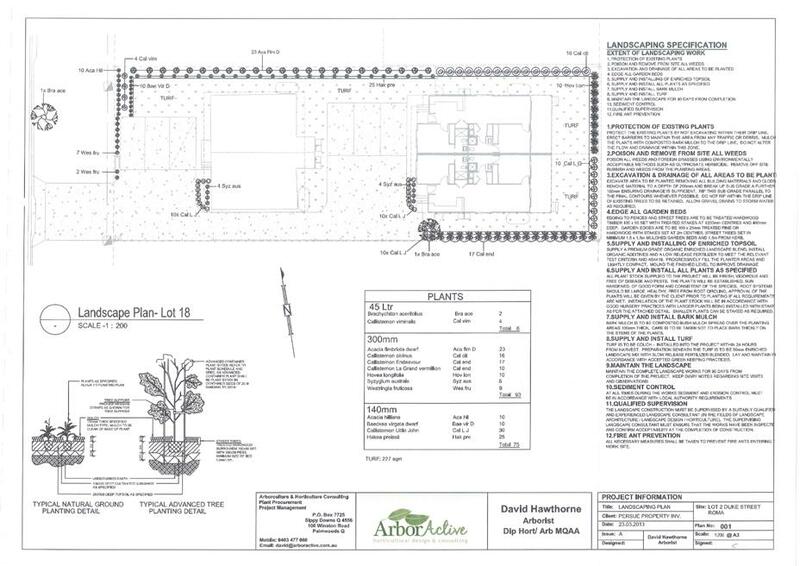 The easements will be located over Lot 70 and 71 in favour of Lot 72. The easements will contain a compacted gravel road, and connect Duck Creek Road with the proposed work area. The main ancillary buildings and structures include a portable site office (15m2), a portable amenities building (15m2) with a shower and toilet, and also a self-bunded diesel fuel storage container (<500m3). The proposal includes a water tank (approximately 5,000L) for a potable water supply, and directing run-off from the disturbed areas to a sedimentation basin, the water from which to be used for dust suppression. The proposal also includes a temporary sewerage facility (transportable ablution blocks), the waste from which will be disposed of by a contractor. The proposal does not include any on-site treatment or disposal of sewerage. The proposed hours of operation are 6am to 6pm, Monday to Sunday. The activity requires up to ten (10) employees on site at any one site. 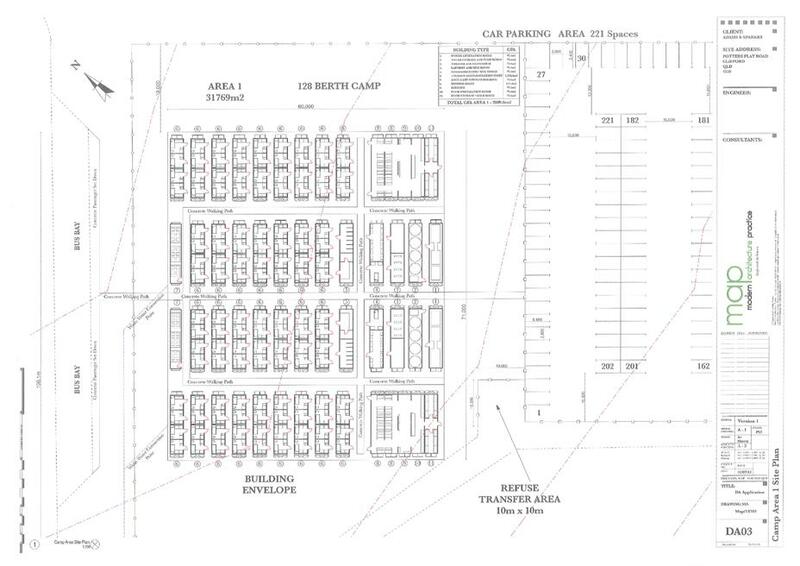 The proposal includes the provision of ten (10) onsite carparking spaces, and an on-site heavy vehicle loading / manoeuvring area, surrounding the stockpile area. The activity requires the use of various light vehicles, “truck and dogs”, B-double and AB-triple road trains. The transport of quarry material is by way of B-triples with side trippers. The anticipated haulage route will be predominantly to the Santos GLNG Project located north-east of the site, with traffic heading north from the site along Duck Creek Road and turning onto Injune Taroom Road. A small portion of traffic will travel south along Duck Creek Road. 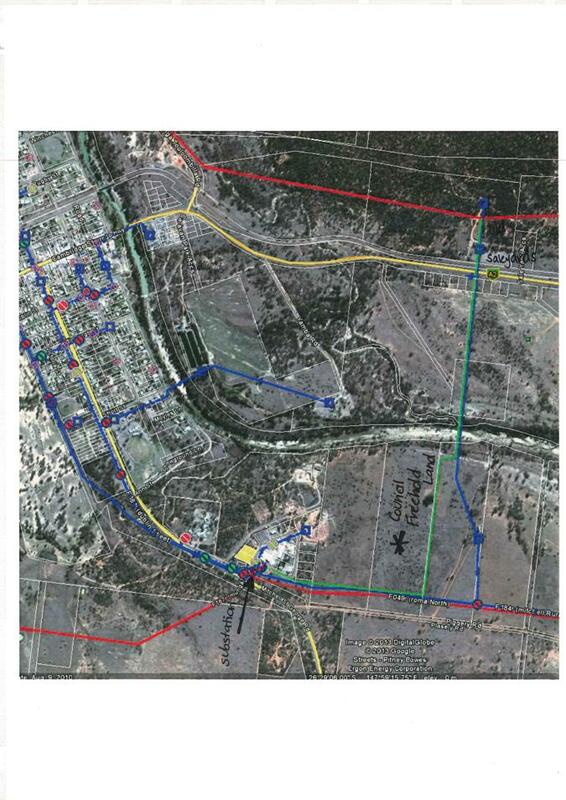 The site is burdened by two (2) gas pipeline easements (refer to Figure 3); one held by Santos Limited, and other by QGC. 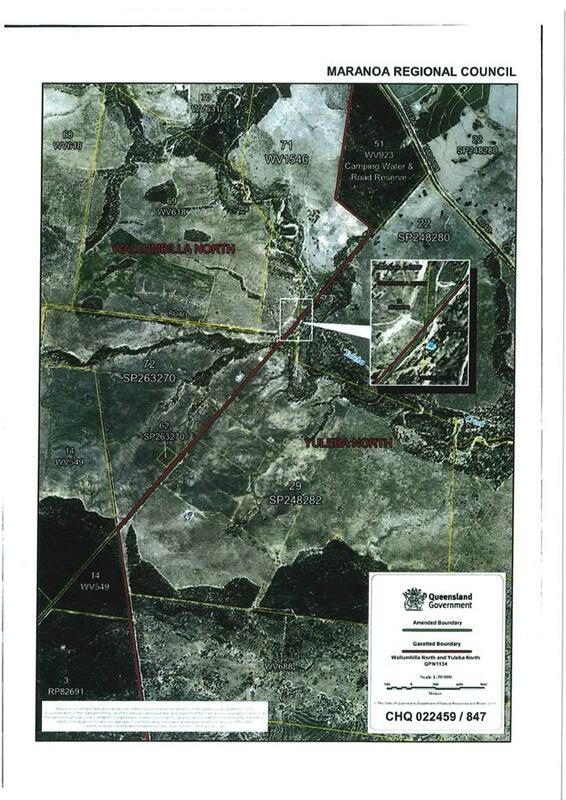 The proposal affects the Santos easement, in that the proposed access easement intersects the easement. The applicant has consulted with Santos, who subsequently provided third party advice, including conditions of development. The third party advice will be included as part of the development approval. 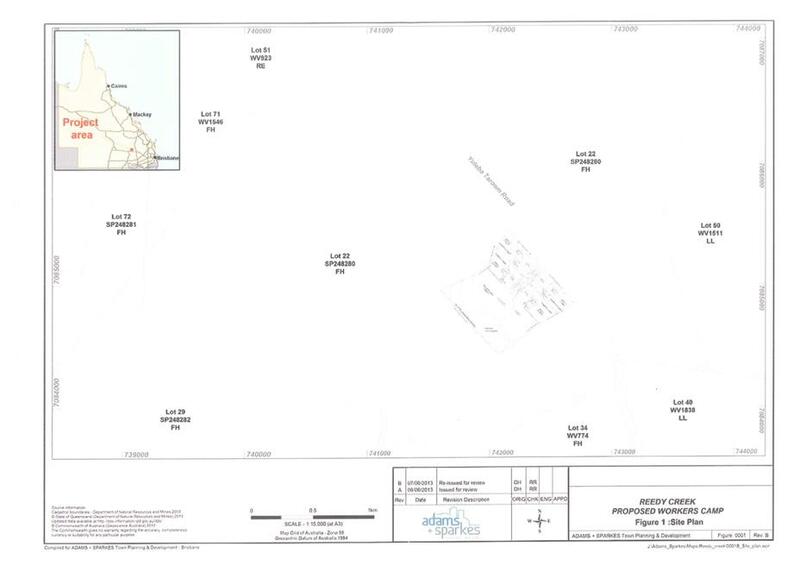 The nearest house to the proposed work area is situated approximately 2.5km to the south-west. The remaining surrounding land uses are predominantly rural grazing land. The site is mapped as containing remnant vegetation, predominantly within the northern half of Lot 72, and a network of watercourses. 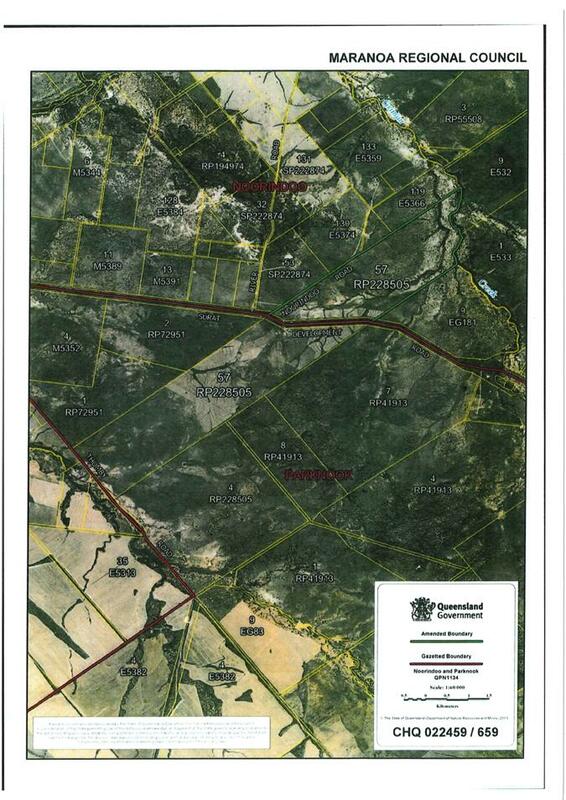 The western half of Lot 70 is mapped as being potential strategic cropping land. We note that the site does not include any clearing of significant vegetation, and only the access easement will be situated within the strategic cropping land. 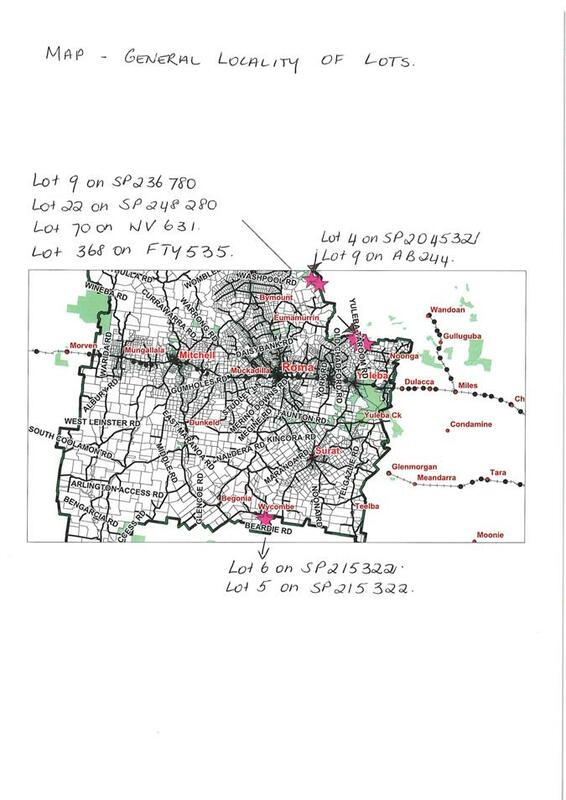 In terms of the planning scheme overlays - the entire site is mapped as being Good Quality Agricultural Land; the northern half of Lot 72 is mapped as containing Protected Areas (correlating with the remnant vegetation mapping); and the northern half of Lot 72 is also mapped as medium bushfire hazard area. The State Assessment & Referral Agency assessed the application in relation to the environmentally relevant activity, and issued a concurrence agency response, dated 20 November 2013, stating they have no requirements. The State Assessment & Referral Agency assessed the application in relation impacts on road infrastructure, and issued concurrence agency conditions of development, dated 21 November 2013. The conditions require the payment of contributions and that DTMR be notified when the use commences. The development application was publically notified between 30 October 2013 and 23 November 2013, and no submissions were received. - Environmental Permit, dated 28 October 2013, authorising the carrying out of ERA 16, extractive and screening activities up to 1,000,000t per annum. "Extractive Industry" means any premises used for the winning or treatment on the land or on adjacent land, or gravel, rock, sand, soil, stone, or other similar materials. The term does not include the removal of materials authorised by Section 106(1) of the Local Government Act 1993, or mining within the meaning of the Mineral Resources Act 1989. Transport Infrastructure Act – extraction of material from roadway. Note: Threshold 3(b) is not a “concurrence ERA”, and therefore does not trigger a concurrence agency referral under the Sustainable Planning Act 2009. The application is subject to Impact Assessment and assessed against the relevant provisions of the planning scheme. The application was publically notified between 30 October 2013 and 23 November 2013, and no submissions were received. The subject site is mapped as containing remnant vegetation, protected areas and medium bushfire hazard. The site of the proposed activity is not located within these areas. Matters relating to bushfire management and mitigating environmental impacts can be appropriately controlled by way conditions of development. The Department of Environment & Heritage Protection has provided an Environmental Permit in relation to the ERA, separate to the assessment under the Sustainable Planning Act 2009. Matters relating to ecological sustainability can be appropriately addressed by way of the mitigation measures detailed in the activity management plans and by way of conditions of development. The subject site is not idewntified as being located in close proximity to, or a place of, historical, cultural or social significance. 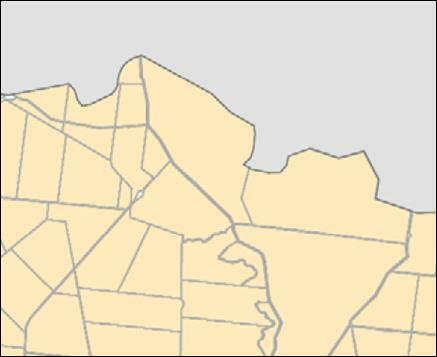 The entire site is mapped as GQAL. Extractive industry is by nature, commonly found within rural areas. The work area covers a relatively small portion of the site (53.73ha of a 5,210ha lot) and does not prejudice the balance areas to be utilised for agricultural purposes. 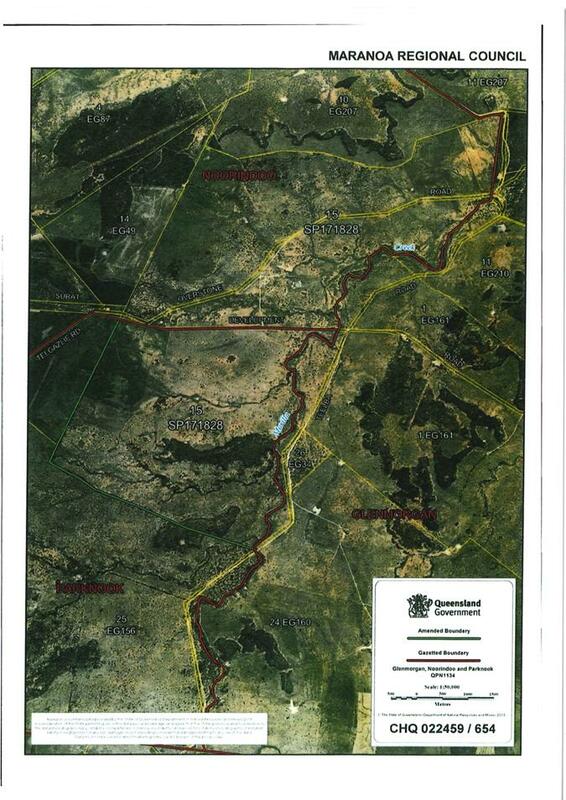 The proposed development is for an extractive industry, suitably located within the rural area. The proposed development is for an extractive industry, providing material for civil construction purposes, and therefore generally contributing to the economic growth of the region. The proposed development will improve local business opportunities to protect and value-add to the existing rural based economy. The proposed development will gain vehicle access via Duck Creek Road (by way of access easements), and includes a water tank, sediment basin, and temporary sewerage facilities in terms of infrastructure. Matters relating to the provision of any infrastructure can be appropriately addressed by way of conditions of development. The proposed development is for an extractive industry. Santos Limited have assessed the proposal in relation to the existing gas pipeline easements, and have issued third party advice, to be included as part of the conditions of development. The proposed development will not prejudice the role of Injune as the main business and community centre. (v) The adverse effects from natural and other hazards, including bushfires area minimised. The Rural Zone Code identifies overall outcomes providing direction about relevant assessment issues. The proposed development utilizes a natural resource, suitably located within the rural area, generally contributing to the economic growth of the region. The proposed development covers a relatively small portion of the site (53.73ha of a 5,210ha lot) and does not prejudice the ability of the balance area and adjoining lots to be utilised for agricultural purposes. Matters relating to environmental impacts can be appropriately addressed by way of the mitigation measures detailed in the activity management plans and by way of conditions of development. The entire site is mapped as GQAL. Extractive industry is by nature, commonly found within rural areas. The work area covers a relatively small portion of the site (53.73ha of of 5,210ha lot) and does not prejudice the ability of the balance areas to be utilised for agricultural purposes. Matters relating to protecting local amenity can be appropriately addressed by way of the mitigation measures detailed in the activity management plans and by way of conditions of development. The proposed development will gain vehicle access via Duck Creek Road, by way of an internal compacted gravel road (contained with the proposed easements). Matters relating to the vehicle access can be appropriately addressed by way of conditions of development. 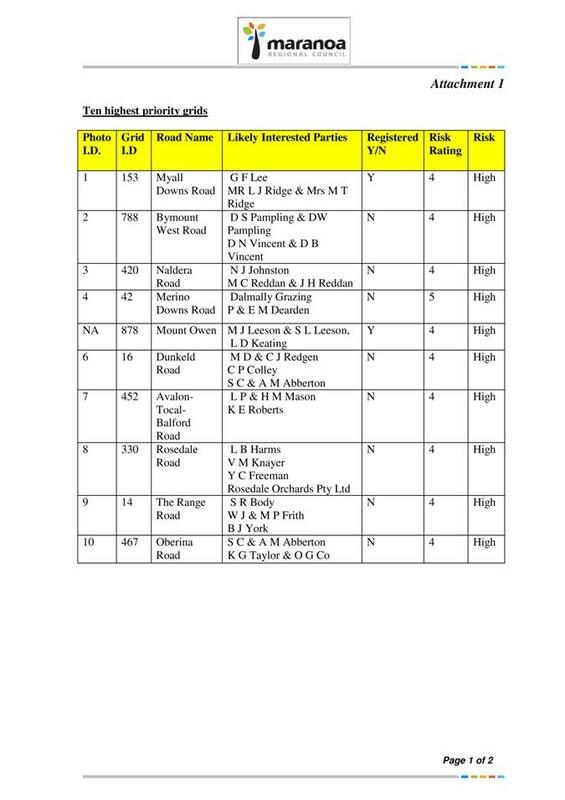 The State Assessment & Referral Agency / Department of Transport & Main Roads have assessed the application in relation to impacts on road infrastructure and have issued conditions of development. Matters relating to bushfire management can be appropriately controlled by way of the mitigation measures detailed in the activity management plans and by way of conditions of development. The proposed development does no represent out-of-sequence development. The subject site is mapped as containing medium bushfire hazard areas. Matters relating to bushfire management can be appropriately controlled by way of the mitigation measures detailed in the activity management plans and by way of conditions of development. Matters relating to the provision of services can be appropriately addressed by way of conditions of development. Any impacts on infrastructure can be appropriately addressed by way of conditions of development. The proposal includes the use of a portable generator. The proposal includes the use of a water tank (approximately 5,000L) for potable water, and a sediment basin to capture water (from disturbed area) for use in dust suppression. The proposal includes providing all vehicles and buildings on site with fire extinguishers. The proposal does not involve any permanent buildings. The proposal includes a temporary sewerage facility (transportable ablution blocks), the waste from which to be disposed of by a contractor. The proposal does not include any on-site treatment or disposal of sewerage. Matters relating to effluent disposal can be appropriately addressed in the conditions of development. The proposal includes a vehicle access point onto Duck Creek Road. The proposal includes an internal compacted gravel road, approximately 10m width (allowing for two-way vehicle movements). The proposal seeks to create an access easement, 10m in width, burdening Lots 70 and 71, in favour of Lot 72, which will contain the internal road. The easement will connect the quarry site with Duck Creek Road. Matters relating to the design and construction of the vehicle access and internal road can be appropriately addressed in the conditions of development. 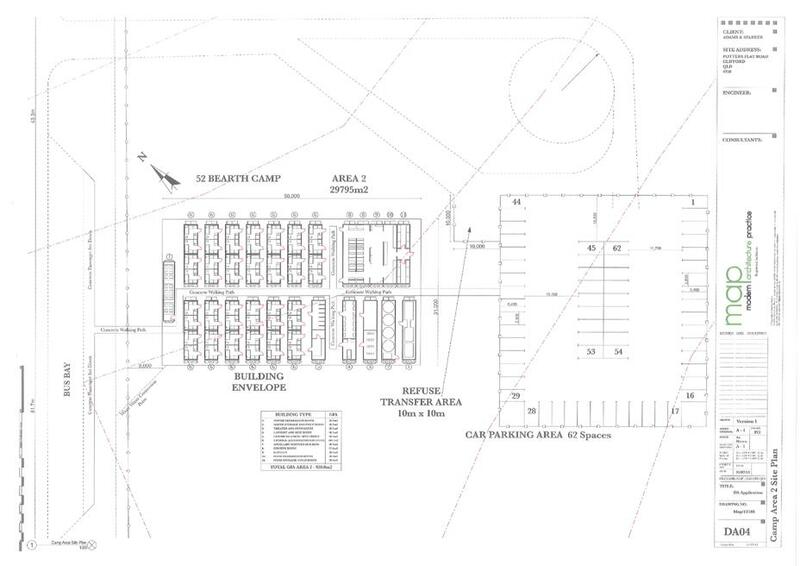 The proposal includes the provision of ten (10) carparking spaces, and includes a loading / heavy vehicle maneuvering area surrounding the stockpile area. 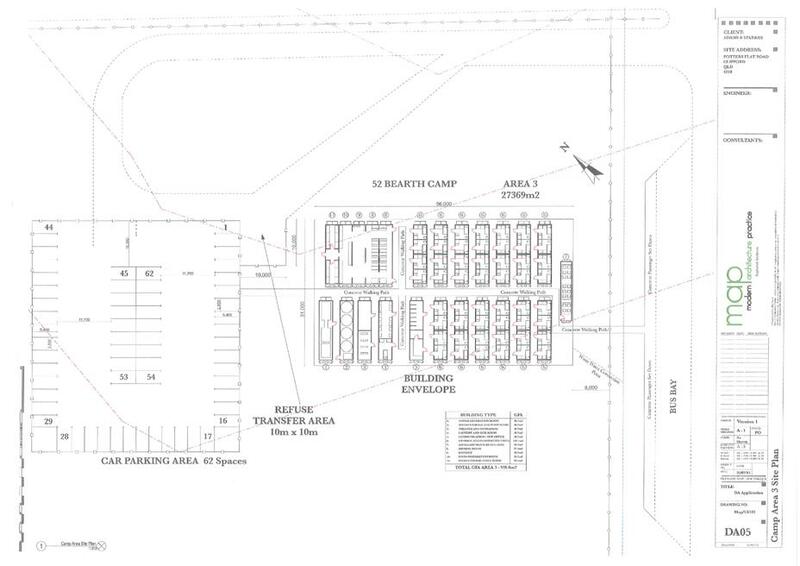 Given that the development is located within a large lot, and requires a maximum of ten (10) employees, it is considered that there is sufficient area for parking, without a need for delineated spaces. Matters relating to the design and construction of the parking and manoeuvering areas can be appropriately addressed by way of conditions of development. The proposal includes an internal road connecting the quarry site with Duck Creek Road. It is anticipated that during an extreme rainfall/flood event, the extractive operations will cease. Matters relating to upgrading the existing access point, internal and local road, can be appropriately addressed by way of conditions of development. SARA/(DTMR) have assessed the development application in relation to impacts on road infrastructure and have issued conditions of development. The subject site is not located contiguous to a state-controlled. The proposal does not represent a noise sensitive development. SARA/(DTMR) have assessed the application in relation to impacts on road infrastructure and have issued conditions of development. 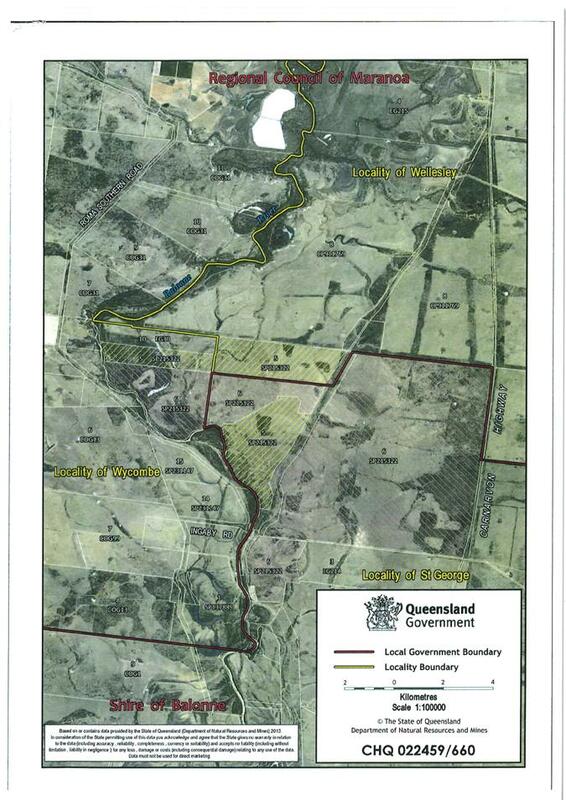 The site contains two (2) gas pipeline easements, held by Santos Limited and QGC. 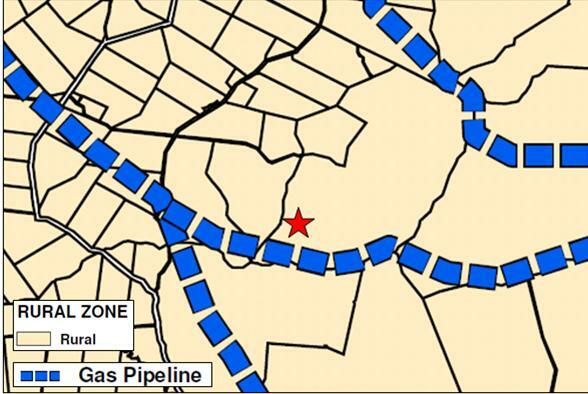 The site of the proposed quarry is not located within 100m of the gas pipeline easements. 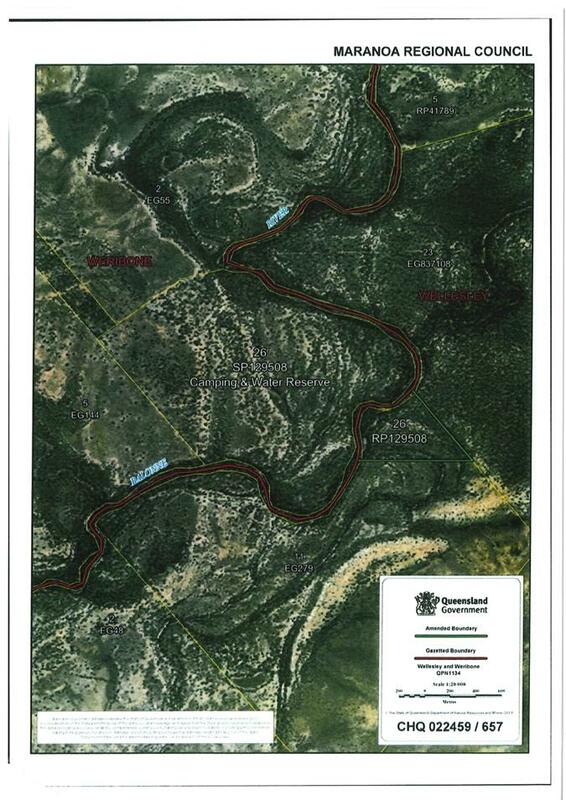 The proposal affects the easement held by Santos, in that the proposed access easement intersects their easement. The applicant has consulted Santos Limited, who issued third party advice, to be included in the conditions of development. The subject site is not located in close proximity to any refuse tips or effluent treatment plants. The subject site is not located in close proximity to any rail corridor land. The subject site is not located in close proximity of any electricity transmission line easement. The subject site is not located in close proximity to any electricity transmission line easement. The subject site contains numerous watercourses. The proposed development provides for buffer areas from the watercourses. Any run-off from disturbed areas will be directed to a sediment basin. The proposal does not include any permanent buildings or structures. Matters relating to flood mitigation can be appropriately addressed by way of the mitigation measures detailed in the activity management plans and by way of conditions of development. Matters relating to air emissions can be appropriately addressed by way of the mitigation measures detailed in the activity management plans and by way of conditions of development. The proposal includes directing run-off from disturbed areas into a sediment basin, the water from which to be used for dust suppression. Matters relating to maintaining water quality can be appropriately addressed by way of the mitigation measures detailed in the activity management plans and by way of conditions of development. Matters relating to construction activities can be appropriately addressed by way of conditions of development. (d) conflict arising from incompatible uses is minimised. The proposed site of the quarry is located approximately 5km from the nearest public road, and 2.5km from the nearest house. The proposal provides for suitable separation distances. (c) does not restrict future operational demands of the airport. The site is not located within close proximity of an airport. The entire site is mapped as GQAL. Extractive industry is by nature, commonly found within rural areas. The work area covers a relatively small portion of the site (53.73ha of a 5,210ha lot) and does not prejudice the ability of the balance areas to be utilised for agricultural purposes. The proposal does not include any significant vegetation clearing. 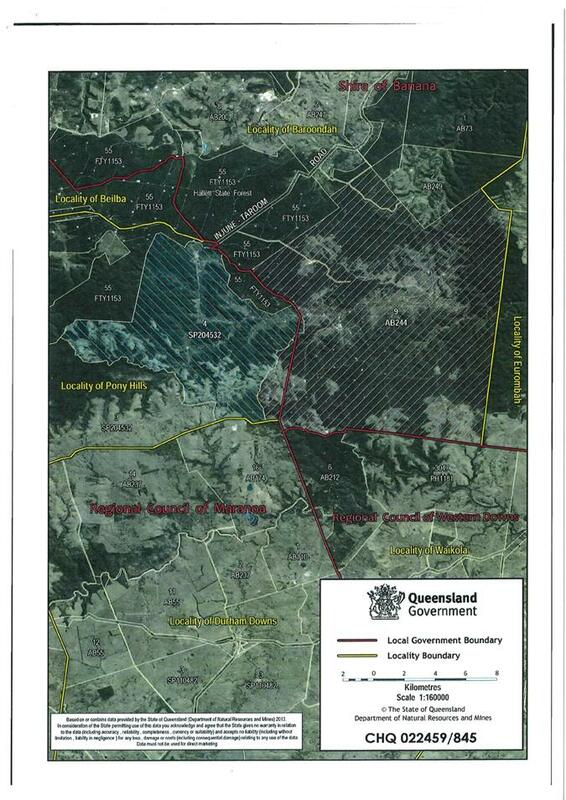 The proposed site of the quarry is not situated within the mapped Protected Areas. Matters relating to minimising landslip erosion and degradation can be appropriately addressed by way of the conditions of development. 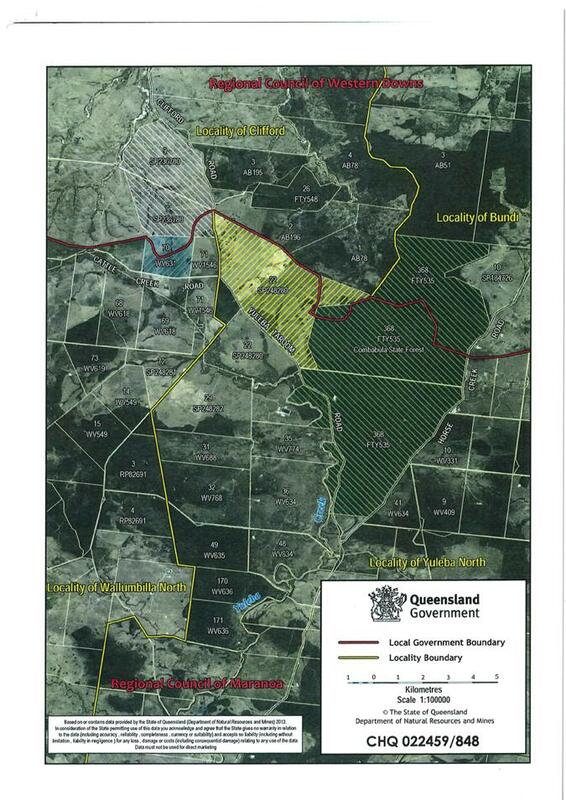 The proposed site of the quarry is not situated within the mapped bushfire hazard areas. The site does not contain any existing buildings. The site has not been identified as containing any cultural heritage significance. The proposal does not include a residential component. The proposal provides for suitable buffers areas, specifically 5km to the nearest public road, and 2.5km to the nearest house. Public notification was carried out between 30 October 2013 and 23 November 2013, and no submissions were received. Although the planning scheme requires Impact Assessment for the proposed use, there is no conflict with the intent of the Bungil Shire Planning Scheme. The development is appropriately located within the Rural area, and any matters relating to environmental impacts, protection of amenity and infrastructure upgrading can be appropriately addressed by way of conditions of development. 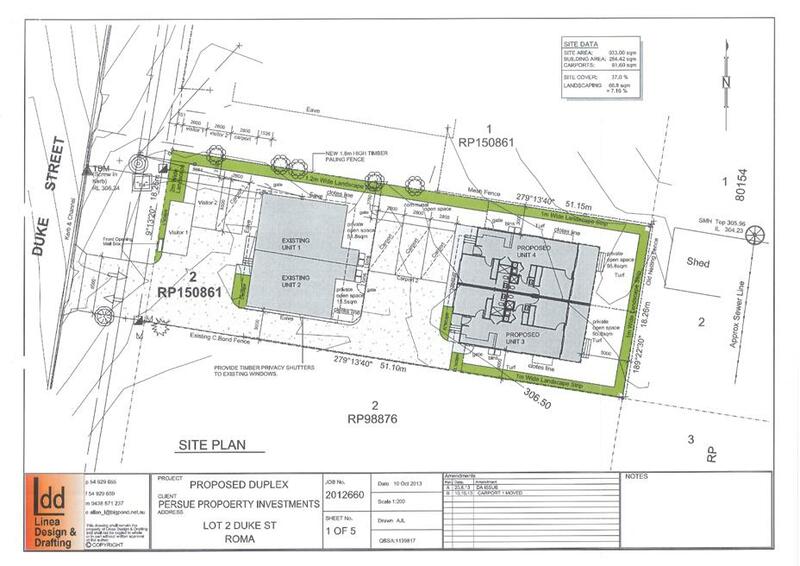 The proposed development is for an “Undefined Use” (Non-resident Workforce Accommodation – 360 Units), seeking to provide accommodation for the workforce associated with the construction of an electricity transmission network in the area, the anticipated need for accommodation being over a period of three (3) years. 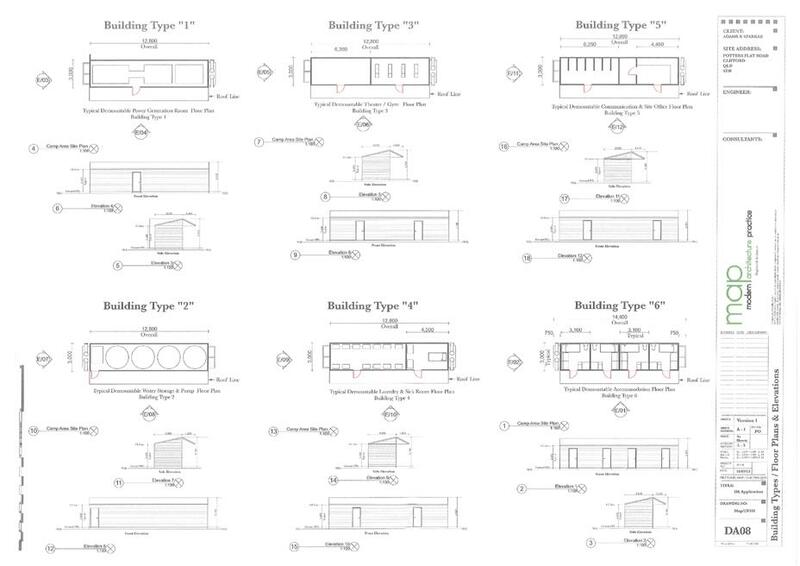 The proposed units are grouped with four (4) units per building. The buildings are approximately 3m in width, 14.4m in length and 3.19m in height, with each unit having a floor area of approximately 9.3m2. The proposal includes the provision of 566 car parking spaces in total (representing a rate of approximately 1.5 spaces per unit), and also bus parking bays. 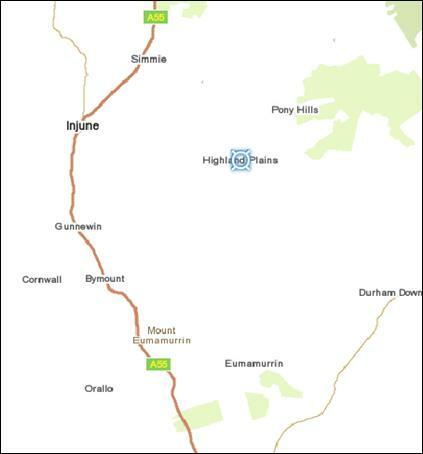 Vehicle access to the site will be provided via Yuleba Taroom Road. An upgrade of the intersection of the site access with Yuleba Taroom Road will be required as will the construction of an internal road. 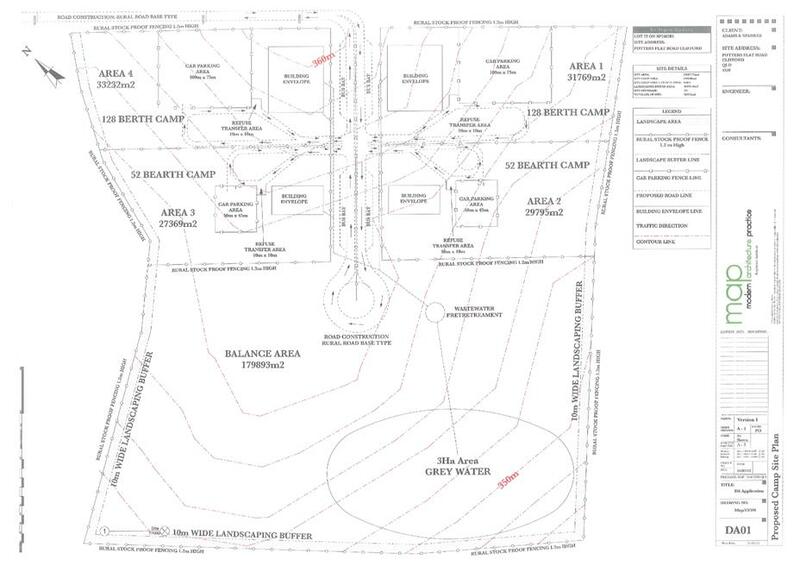 The proposal includes a 1.2m high fence along the entire perimeter of the camp sites (and balance area), and also includes a 10m wide landscaping strip along the northern, southern and western boundaries of the overall site. The proposal provides a buffer from existing watercourses and does not include clearing of any remnant vegetation. The development included a Site Based Management Plan - “Seven Trees” Accommodation Camp, dated June 2013, prepared by Adams+Sparkes Town Planning + Development. The development application was publically notified between 4/11/13 and 25/11/13, and no properly made submissions were received. The State Assessment & Referral Agency as a Concurrence Agency for the development have carried out an assessment in relation to impacts on state-controlled infrastructure, and have issued conditions of approval (refer to Attachment 4). The proposal includes Environmentally Relevant Activity 63 – Sewerage treatment (daily peak capacity of more than 100 EP, but less than 1,500 EP). However, the ERA is not a “concurrence ERA” and therefore referral was not required, with the associated Environmental Authority to be obtained separately. The proposed use is undefined under the Bendemere Shire Planning Scheme. 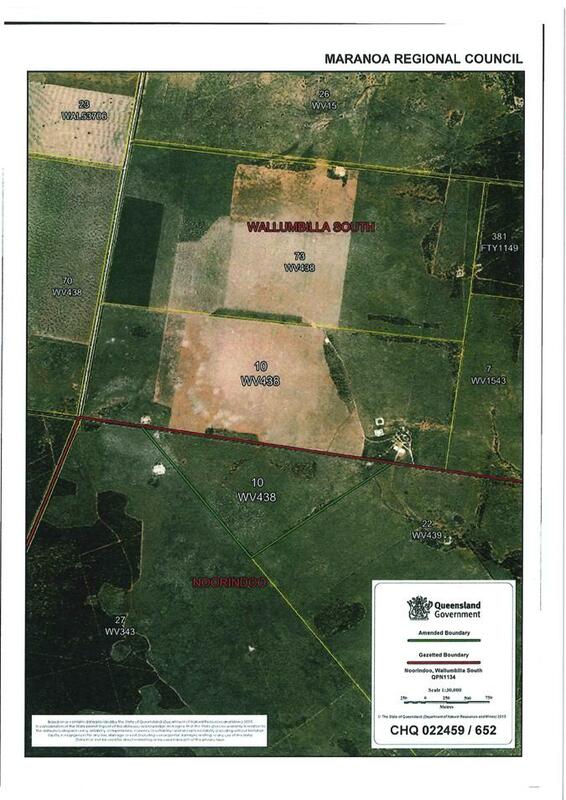 The site is situated at Yuleba Taroom Road, Yuleba North QLD 4427, described as Lot 22 on SP248280 (refer to Figure 1 – Locality Plan). The site has an area of 2,395ha and is currently vacant. The surrounding land uses are predominantly rural grazing land and homesteads. 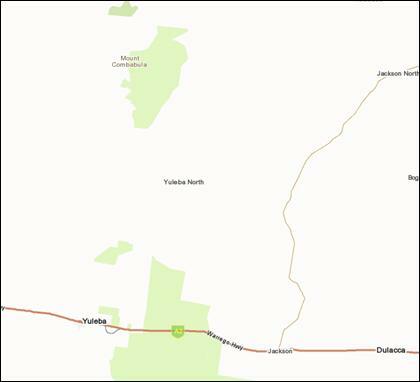 Yuleba Taroom Road intersects the site (refer to Figure 2 – Site boundaries). The site is situated in the Rural Zone of the planning scheme (refer Figure 3 - Zoning). Although the planning scheme requires that the proposed development be assessed against the Impact Assessable provisions of the planning scheme, the development does not conflict with the intent of the planning scheme for the zone in which it is to be located. The proposed development provides for suitable buffer areas from watercourses and does not include the clearing of any remnant vegetation. Any environmental impacts in terms of land degradation can be appropriately controlled by way of the mitigation measures detailed in the Site Based Management Plan, and by way of conditions of development. Any environmental impacts in terms of ecological sustainability, in particular maintaining water quality, can be appropriately controlled by way of the mitigation measures detailed in the Site Based Management Plan, and by way of conditions of development. Portions of the site are identified as containing GQAL. The proposed development is temporary in nature and appropriately located in close proximity to the construction activity it will be servicing. The proposed development will be operated within a relatively small section of the overall site and will not adversely impact on the ability of the balance area to be used for agricultural purposes. The proposed development will not prejudice the operation of resource industries within the region. The proposed development generally contributes to the economic growth of the region. The proposed development is temporary in nature and appropriately located in close proximity to the construction activity it will be servicing, and generally contributes to the economic growth of the region. The proposed development will generally improve local business opportunities to protect and value-add to the existing rural based economy. The proposed development includes a suitable vehicle access and provision of services. Matters relating to the design and construction of vehicle access and the provision of services can be appropriately addressed by way of conditions of development. The proposed development, namely workers accommodation, is temporary in nature, and will not prejudice existing residential areas. The proposed development is temporary in nature, and will not adversely impact on the operations of established infrastructure networks. 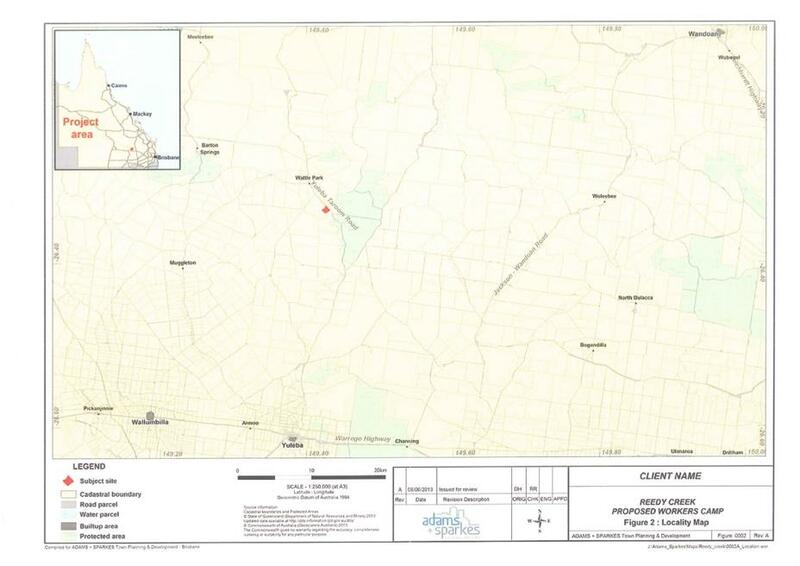 The subject site is identified as containing portions of medium bushfire hazard area. Having regard for the temporary nature of the use, and that the site provides for suitable buffer areas and a minimum of 20,000L water supply, it is considered that matters relating to bushfire mitigation can be appropriately addressed by way of conditions of development. The proposed development will cater for the accommodation needs associated with the construction of electrical infrastructure within the region. The proposed development is temporary in nature and appropriately located in close proximity to the construction activity it will be servicing. The development generally contributes to the economic growth of the rural area. The proposed development is temporary in nature and appropriately located in close proximity to the construction activity it will be servicing, and will not prejudice rural activities in the surrounding locality. Any environmental impacts can be appropriately controlled by way of the mitigation measures detailed in the Site Based Management Plan, and by way of conditions of development. The proposed development is contained within a relatively small portion of a large rural lot, and will not impact adversely on the rural amenity. The proposed development provides suitable buffer areas, landscaping, and vehicle access and manoeuvring areas (including the use of road base to reduce dust) to ensure that the rural amenity is protected. 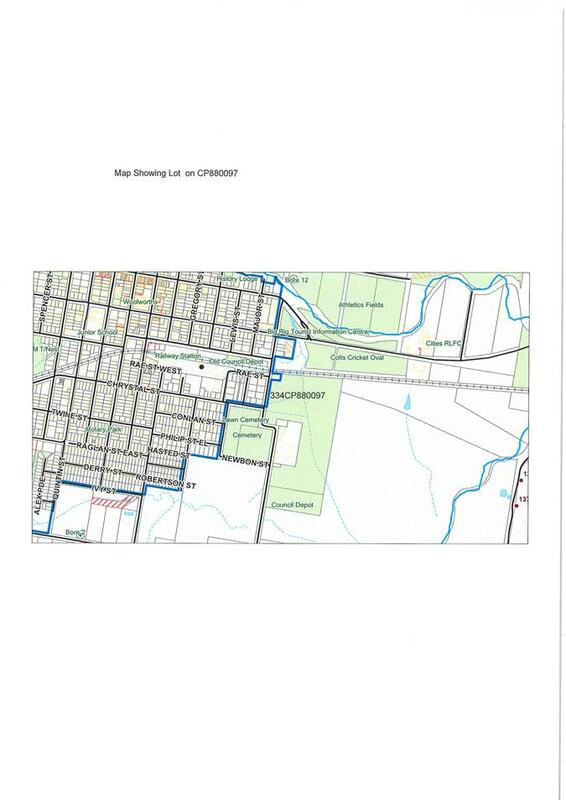 The proposed development is located within a relatively small section of a large rural lot, and will not prejudice or adversely impact on other uses, including established uses within other Zones. 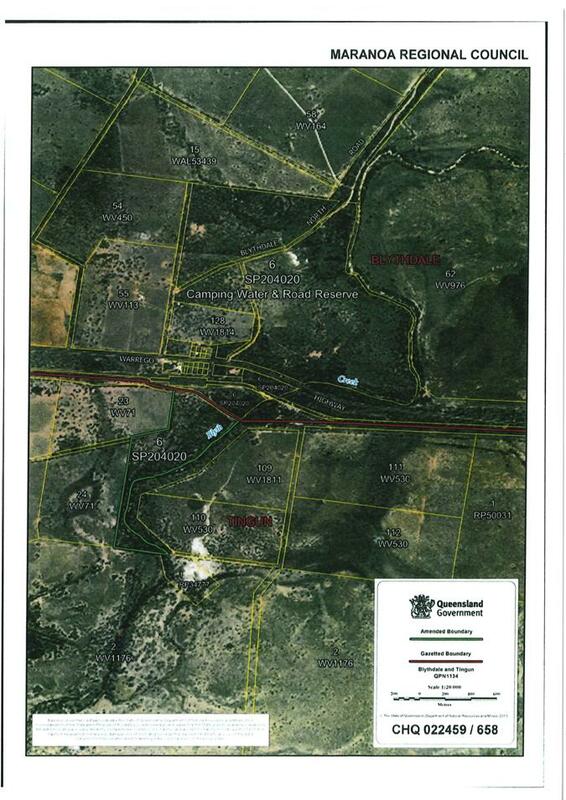 The proposed development has access to Yuleba Taroom Road and includes an internal road. Matters relating to the upgrade of the intersection and construction of the internal road can be appropriately addressed by way of conditions of development. The proposed development does not prejudice the efficient provision of infrastructure. 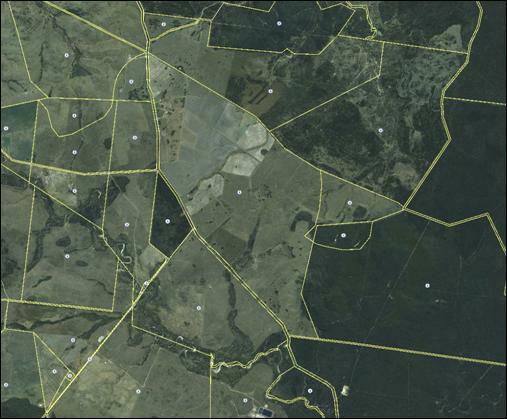 The subject site is identified as containing areas of medium bushfire hazard. Having regard for the temporary nature of the use, and that the site provides for suitable buffer areas and a minimum 20,000L water supply for fire fighting purposes, it is considered that matters relating to bushfire mitigation can be appropriately addressed by way of conditions of development, as can matters relating to flood and landslide mitigation. The proposed development provides for all necessary services, the design of which can be appropriately addressed by way of conditions of development. The proposal includes the provision of on-site electricity generators, suitable for the use. 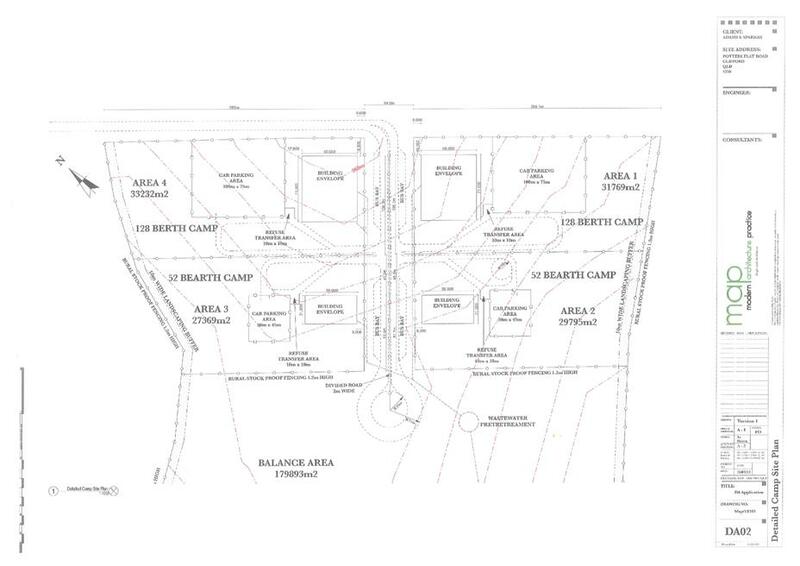 The proposal includes connecting each of the camp areas with on-site water tanks (water to be delivered to the site by trucks) to meet operational needs and a minimum of 20,000L to be available for fire fighting purposes. Matters relating to the provision of a water supply can be addressed in the conditions of development. The proposal includes an on-site sewerage treatment facility (daily peak capacity of more than 100 EP, but less than 1,500 EP), treating up to 100,000L of waste water per day. 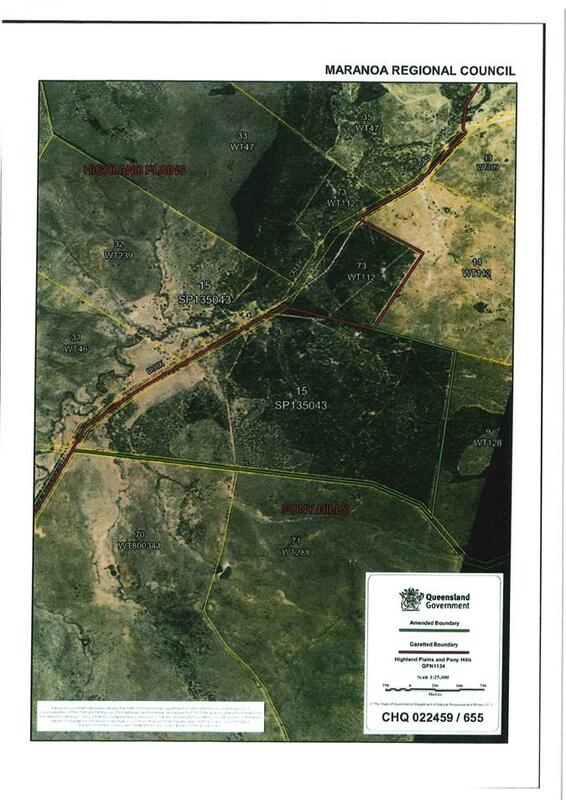 The proposal also includes a 30ha grey water disposal area. Matters relating to on-site effluent disposal can be addressed in the conditions of development. Matters relating to stormwater management can be addressed in the conditions of development. 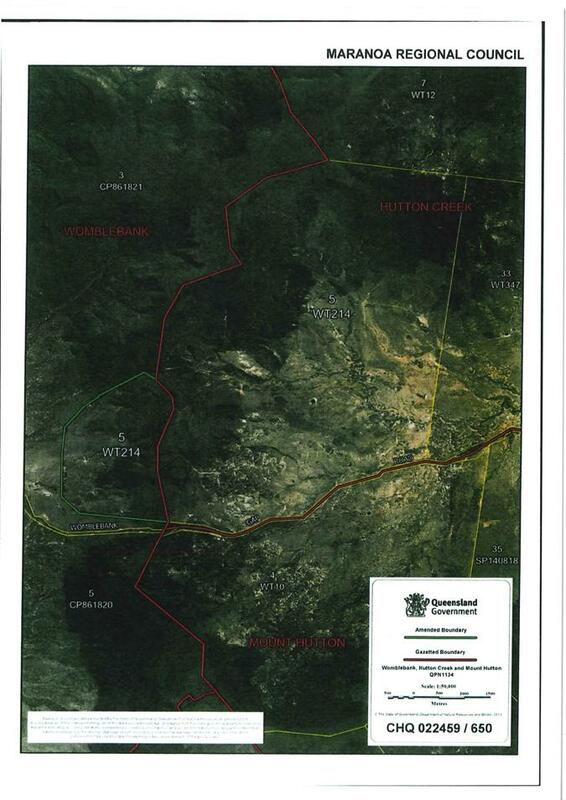 The proposal includes vehicle access from Yuleba Taroom Road and an internal road. It was determined that an upgrade of the intersection is required to cater for the proposed use. Matters relating to the design and construction of the vehicle access and the internal road can be addressed in the conditions of development. The proposal includes the provision of 566 car parking spaces in total (representing a rate of approximately 1.5 spaces per unit) and also bus parking bays, adequate for the proposed use. Matters relating to the design and construction of parking and manoeuvring area can be addressed in the conditions of development. Matters relating to the design and construction of vehicle access can be addressed by way of conditions. The subject site is not located in close proximity to a State-controlled road. The proposal provides for suitable buffer areas from the road to the proposed units to ensure that noise is not an issue. N/A - The subject site is not located in close proximity to any refuse tips or effluent treatment plants. N/A - The subject site is not located in close proximity to any rail corridor land. N/A - The subject site is not located in close proximity to any electricity transmission line easement. 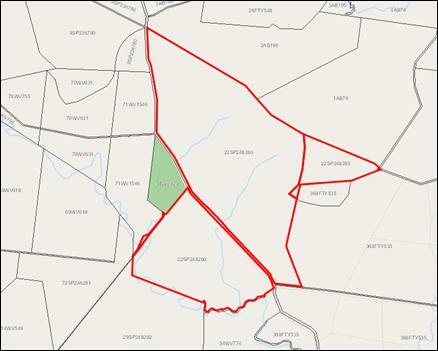 N/A - The subject site is not located in close proximity to any electricity transmission line easements. The proposed development provides for suitable buffers from any watercourses. There is evidence of substantial flooding in the watercourse to the west however none of the proposed site shows signs of being affected by flood. Given the temporary nature of the development, it is considered that flooding is not a significant issue and can be addressed by ensuring the development is constructed in accordance with the approved plans. It is considered that the proposed development will not create significant noise emissions. Matters relating to excavation and filling can be addressed in the conditions of development. The proposed development does not include any significant vegetation clearing. The proposed development provides for a minimum 100m buffer to any protected areas. The proposed development is not located on slopes greater than 15%. N/A – The site is not located in close proximity to any character buildings. N/A – The site is not located in close proximity to any cultural heritage areas. The use should ensure high levels of fire safety. The proposed development provides suitable buffer areas and on-site water supply for fire fighting purposes. Council road network is not unduly affected by the establishment of the camp. The subject site is not located in close proximity to the shire network roads identified in Maps P1 and R1. An upgrade of the intersection of the site access with Yuleba Taroom Road is required to be upgraded to cater for the development. The establishment of the camp does not unduly affect existing residential premises. The proposed development is not located within 30m of any existing residential premises or within 15m of a roadway. 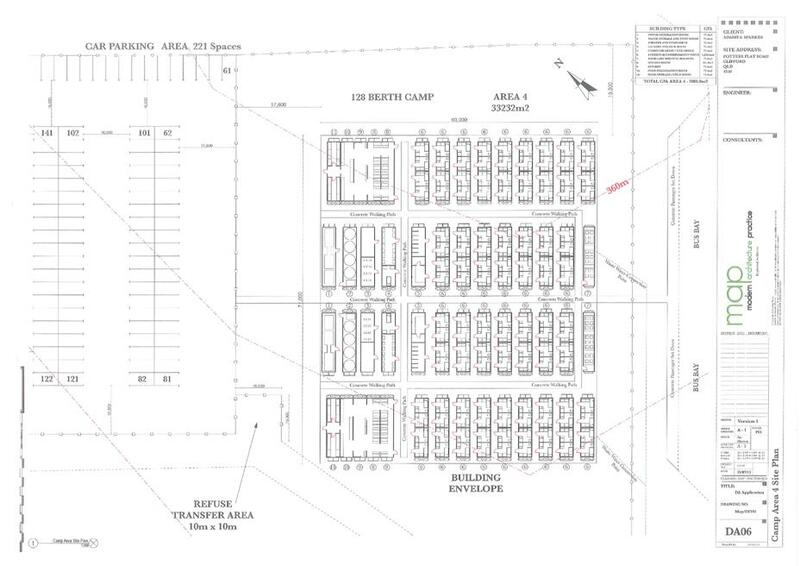 The camp buildings, layout and construction do not substantially detract from the amenity of the surrounding area. 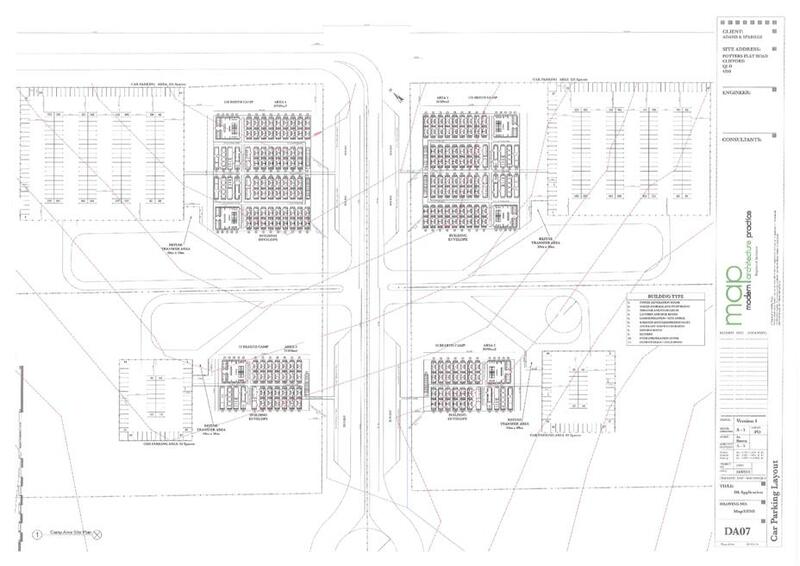 The proposed development does not comply with Acceptable Solution 62.3, which requires that buildings be located at least 3m apart; sited in clusters with no more than 6 buildings per cluster; and the space between clusters is to be no less than 10m. 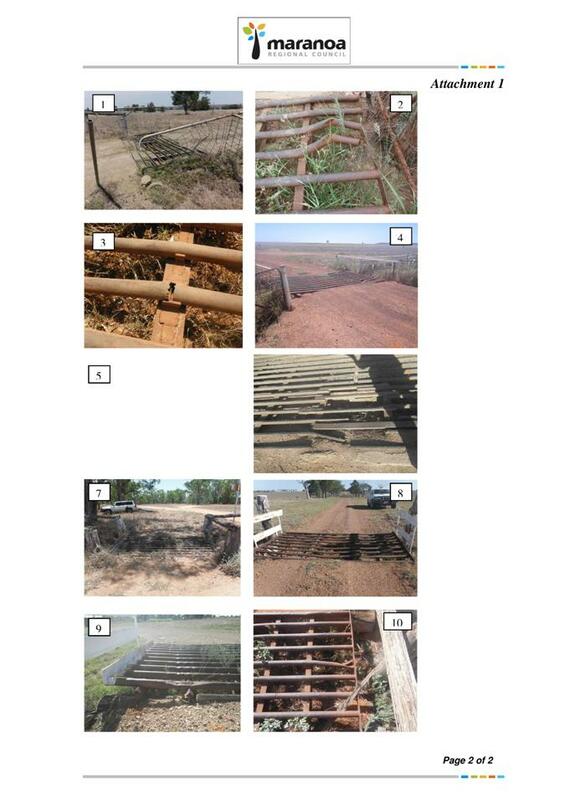 - the development is suitably setback from Yuleba Taroom Road. No submissions were received by Council during the public notification period (4/11/13 to 25/11/13). The State Assessment & Referral Agency response, dated 11 December 2013, includes a conditions which form part of the approval (refer Attachment 4). An Approval for Operational Works will be required. An Environmental Authority to operate Environmentally Relevant Activity 63 – Sewerage treatment, may be required from the Department of Environment & Heritage Protection.